Returning at twilight from the pool to their adobe-style accommodations, a couple navigates the varied fauna adorning the grounds of Spirit Ridge..
At first blush, a luxury resort seems an unlikely place to learn about First Nations culture and sacred beliefs. 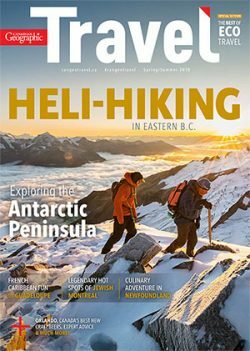 But Spirit Ridge Lodge at Nk’Mip Resort — located between Osoyoos Lake and the starkly beautiful Anarchist Mountains of British Columbia’s South Okanagan Valley — is not your average high-end getaway. 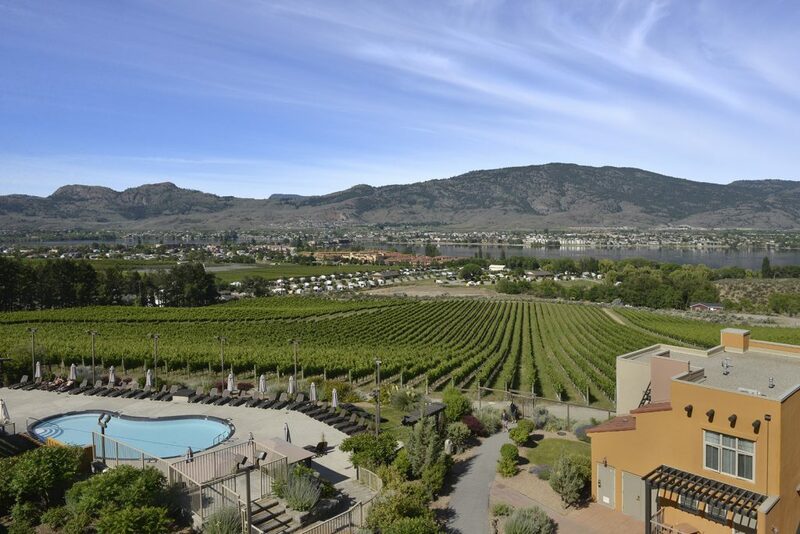 Situated on Osoyoos Indian Band land and in Canada’s only true desert, the deluxe lodge happily co-exists with the band’s many additional business ventures, including an RV park and campground, a championship golf course and an award-winning winery. But there’s also a celebrated interpretive centre offering a full menu of Indigenous experiences. 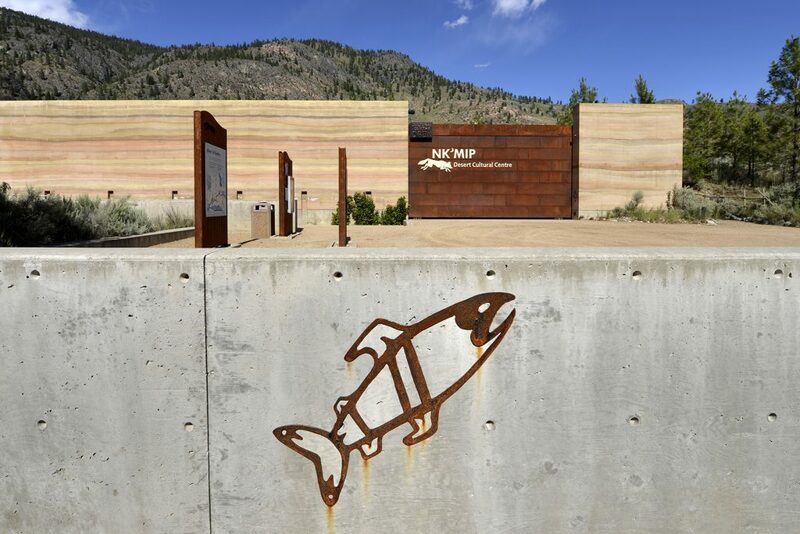 The Spirit Ridge property itself is dotted with an abundance of First Nations detail, from bilingual traffic signs in English and the local Okanagan language to dramatic iron, stone and wood-carved artworks of sacred creatures such as bears, eagles, salmon and turtles. Overhead, impressive figural sculptures depicting Indigenous imagery look out from rooftop perches. Collectively, these totems act as ever-present reminders of exactly who stewards this land. 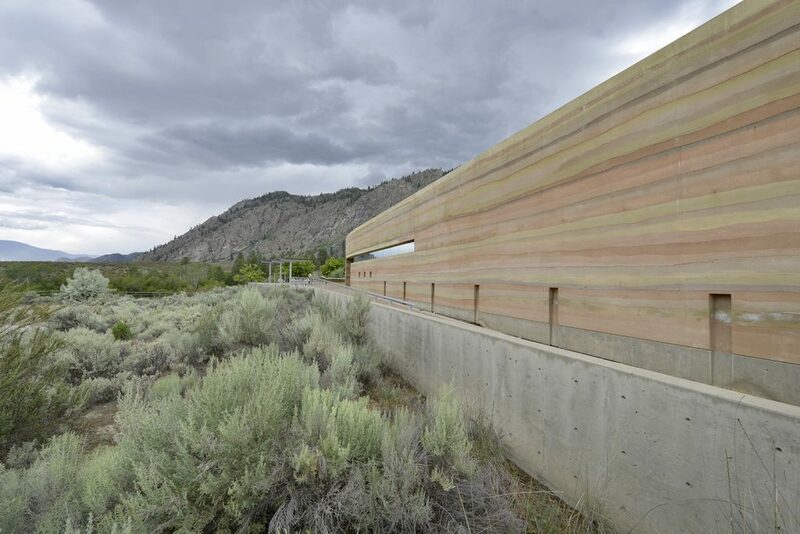 Guests admire the grand sculpture that greets visitors at the entrance to Spirit Ridge, created by Smoker Marchand, a member of the Colville Confederated Tribes. Marchand’s work embodies the stories of First Nations peoples. 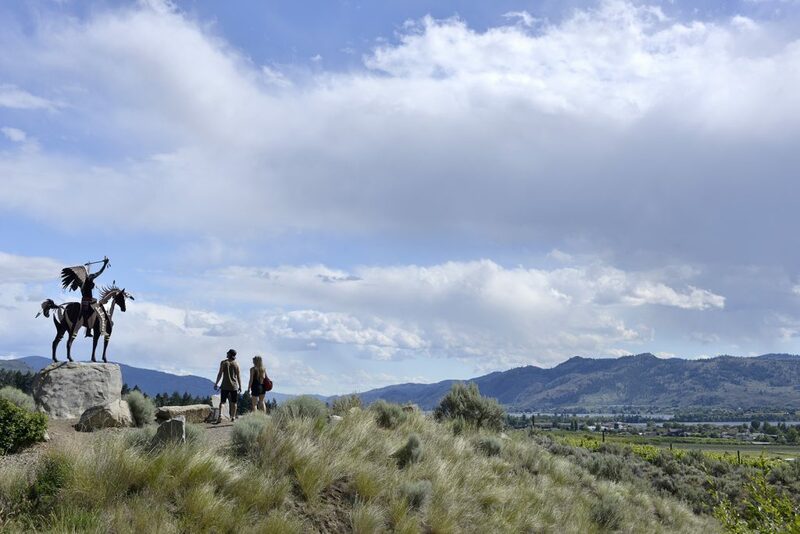 A spectacular view of the NK’Mip Vineyards leading to the RV Park and Campground situated on the edge of Osoyoos Lake. 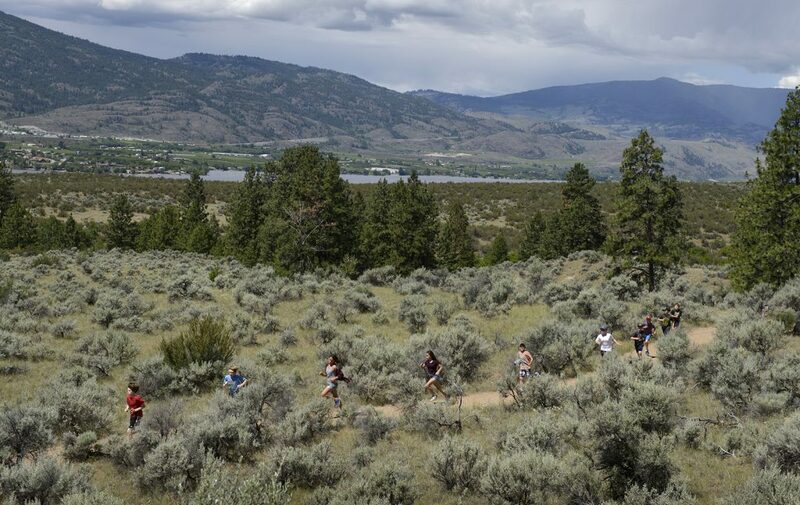 Beyond that lies the town of Osoyoos. 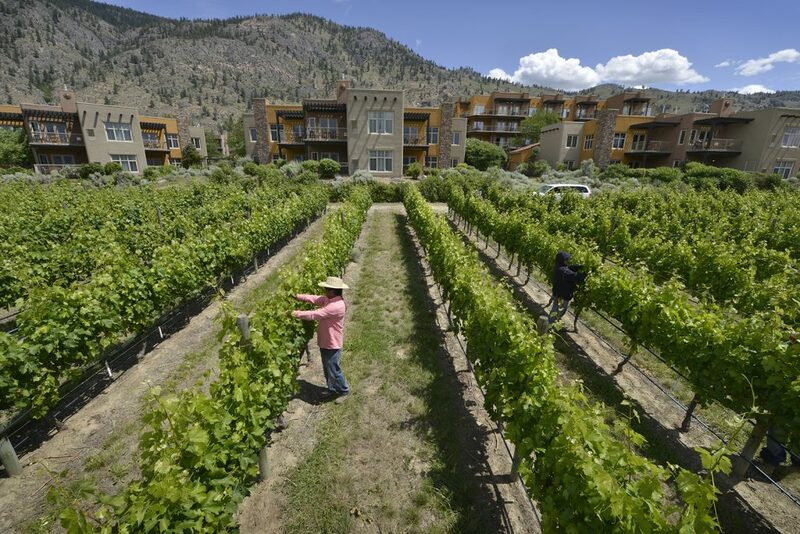 The economic prosperity enjoyed by the Osoyoos Indian Band has resulted in virtually full band employment and the welcome need to bring in workers to cover a wide variety of jobs, including the tending of the NK’Mip Vineyards. 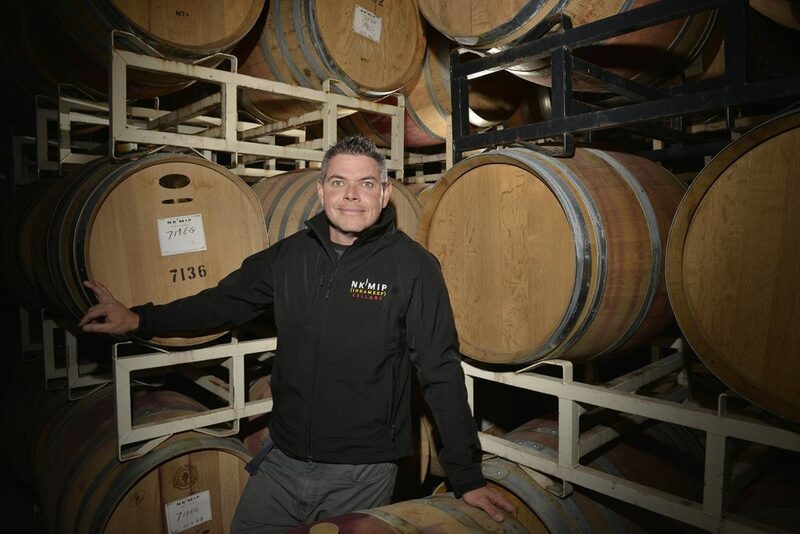 Following extensive schooling in the art of winemaking and a stint at an Australian winery, Justin Hall returned home to become a winemaker at Nk'Mip Cellars. An Osoyoos Indian Band member, he is widely respected in the community for his work ethic and entrepreneurial spirit. 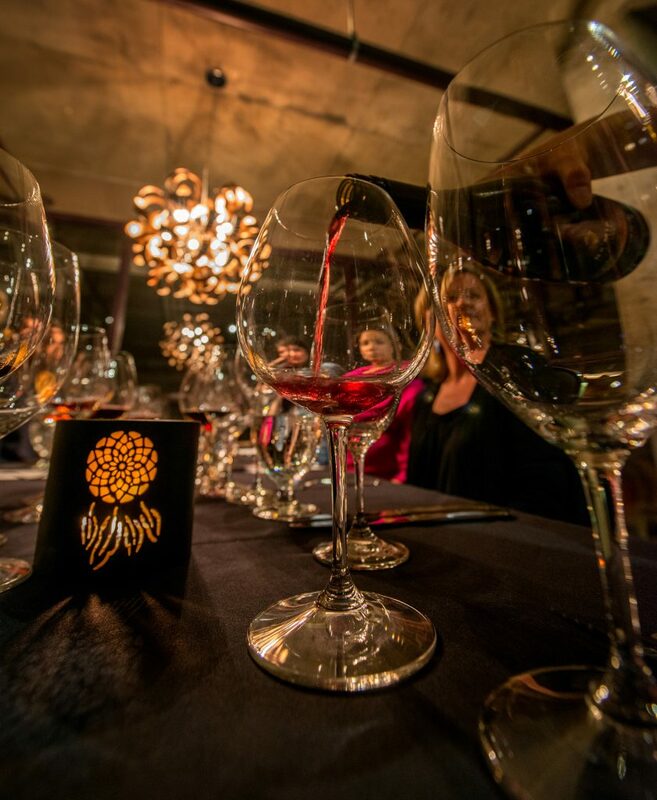 Guests enjoy fine wine, dreamcatcher candles and food pairings at NK’Mip Wine Cellars, the first Indigenous-owned winery in North America. The distinctive layered look of the Nk'Mip Desert Cultural Centre was created using a modern adaptation of an ancient building technique called “rammed earth.” Varying concentrations of concrete, local soil, dyes and minerals are tamped down in individual layers. The emerging striated pattern symbolizes — among other themes — the passage of time, the local geography and one’s ancestry. One of the many iron renderings of sacred creatures adorning the Nk'Mip Desert Cultural Centre. The salmon symbolizes prosperity, abundance, renewal and the cycle of life. 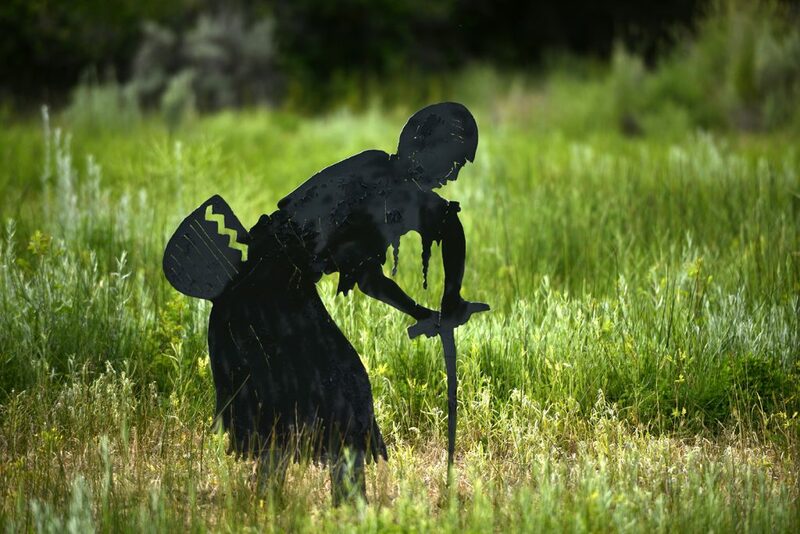 Rounding a corner on the Cultural Centre's trails, visitors might be startled to see the silhouettes of root diggers represented by iron sculptures. Bitterroot, or "Speetlum," is an important food for the Okanagan peoples and women and children participate in the communal harvest. 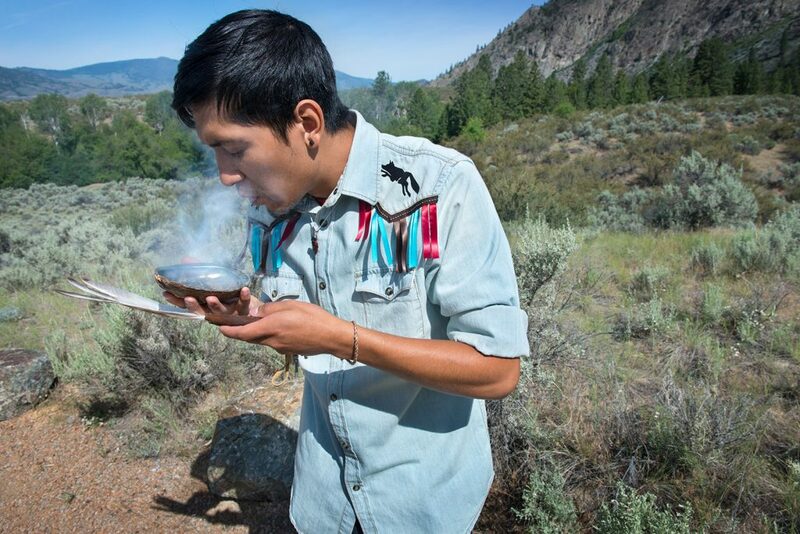 Dyawen Louis, member of the Lower Similkameen Band and interpreter at the Nk'Mip Desert Cultural Centre, prepares sage for a traditional smudging ceremony, performed to purify or cleanse a person, place or object. The exact beliefs surrounding the ceremony vary from one Indigenous culture to another. 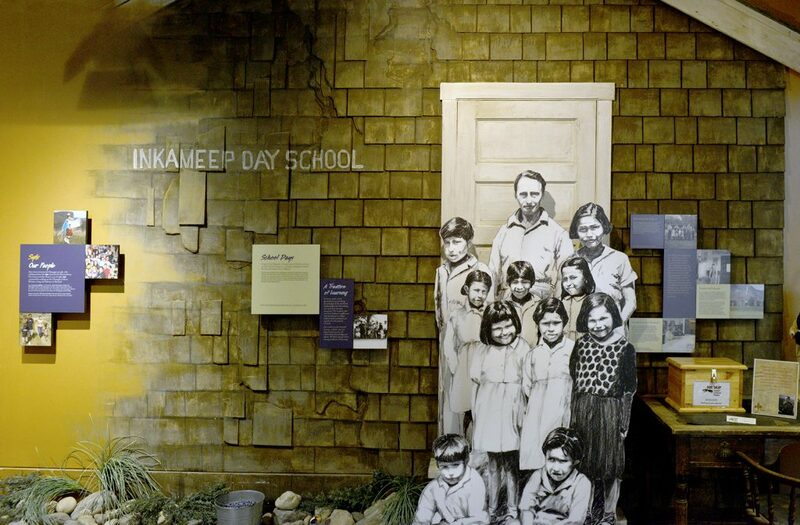 A display at the Nk'Mip Desert Cultural Centre addressing the first day school on the Osoyoos Reserve and the difficult topic of residential schools. 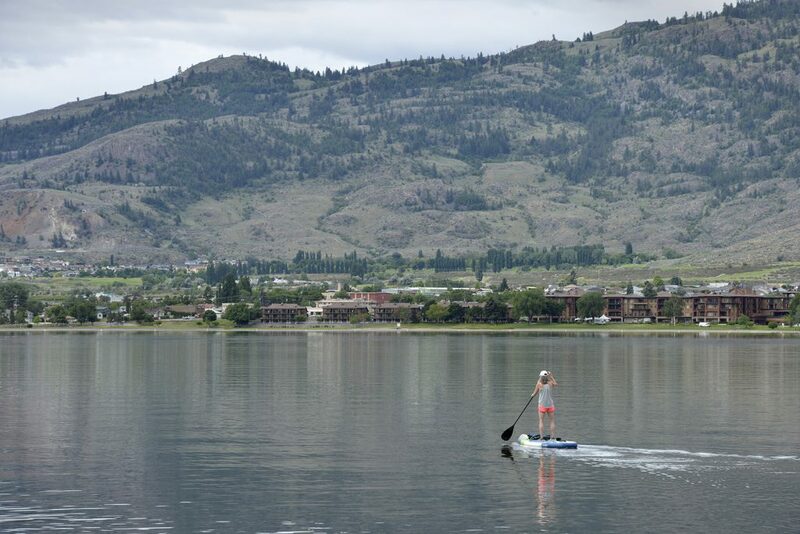 RV enthusiast Annette Paul paddles around on Osoyoos Lake, which straddles the border between British Columbia and Washington State. The lake's name is derived from the Okanagan language word for "narrowing of the waters." On the other side of the lake is the town of Osoyoos. 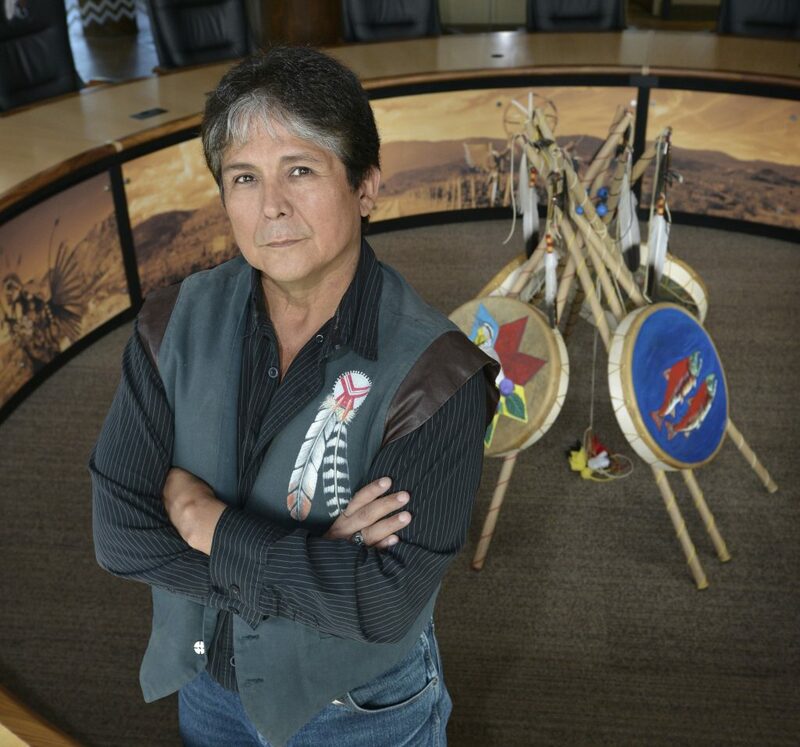 Chief Clarence Louie, intrepid leader of the Osoyoos Indian Band and CEO of the Osoyoos Indian Band Development Corporation, stands in the new Osoyoos Indian Band office’s council chambers in Oliver, BC. The baking heat of the midday sun isn't enough to slow down these children, propelled by the excitement of a day outside the school walls and the promise of a live snake presentation down the path at the Nk’Mip Desert Cultural Centre. 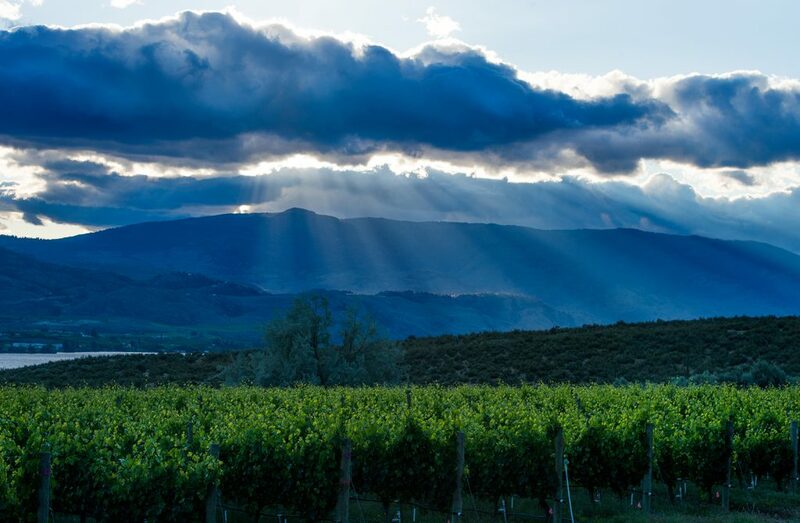 A brief but enthusiastic rain shower transforms into a spectacular sunset over Osoyoos Lake, with the NK'Mip Cellars vineyard catching the last of the day’s sun in the foreground.